Free of gluten and of refined sugar, these Dark Chocolate Coconut Squares are filled with nothing but wholesome ingredients. But they taste so good, no one will ever believe it. But really… who needs to know, right? So I was watching hockey with my boyfriend the other night and we got a sudden craving for a little something sweet… He went to the kitchen and returned with a bag of dates and a bar of 85% dark chocolate. We started eating the two of them together and I immediately fell in love! I just knew right then and there that I’d have to make something out of this heavenly union. At first, I was shooting for simple dark chocolate coated dates, but then my vision evolved and eventually transformed into the crazy decadent but surprisingly healthy Dark Chocolate Coconut Squares that you see before you. You’re looking at a super thick layer of creamy, rich, smooth and silky dark chocolate filling that feels just like the most decadent of truffles, trapped between two layers of crunchy, slightly sweet and crumbly oats and coconut crust. Can you say yum? And yes please? 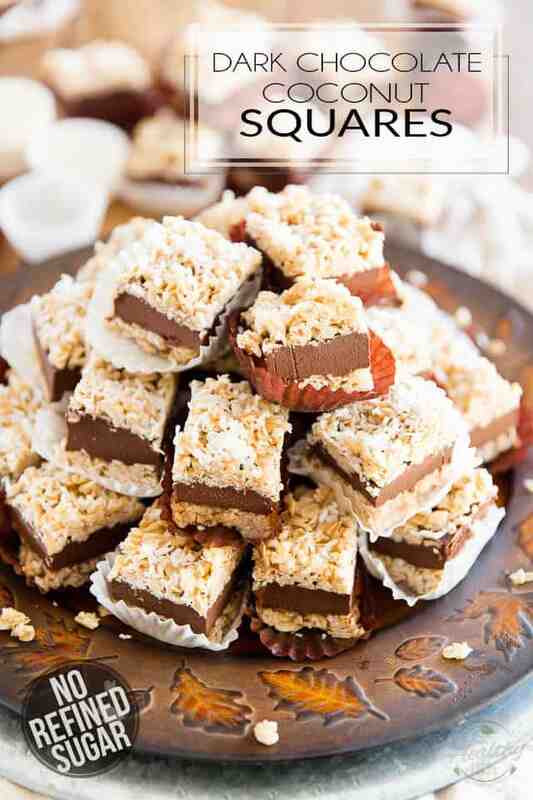 The post Dark Chocolate Coconut Squares appeared first on The Healthy Foodie.